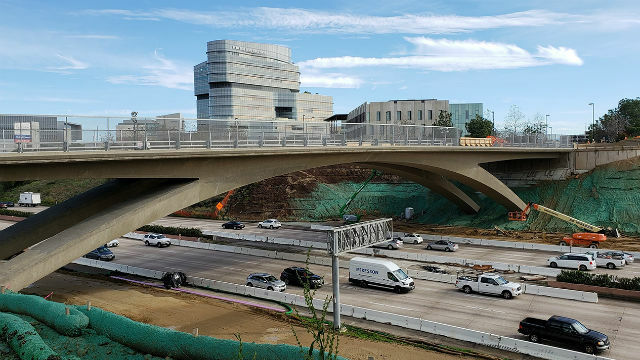 Officials from UC San Diego, the SANDAG and Caltrans celebrated the completion Thursday of a bridge over Interstate 5 at Gilman Drive connecting the east and west sections of the campus. SANDAG and Caltrans work crews finished the bridge in November after several weeks of construction that necessitated freeway closures in both directions. The bridge is expected to open to the public Friday, weather permitting. “This is just one of many projects that are transforming UC San Diego into a thriving live, learn, play community, which will enhance the student experience and establish UC San Diego as a destination for the greater community,” said Chancellor Pradeep Khosla. SANDAG officials expect the bridge’s opening to result in notable improvements to street traffic, air quality and parking demand in La Jolla Village. In addition to two lanes of traffic, the bridge includes sidewalks and bike lanes as well as a pedestrian bridge that connects to student housing in the Mesa Nueva neighborhood. The 406-foot bridge is part of the Metropolitan Transit System’s Mid-Coast Trolley Blue Line Extension, which includes an 11-mile extension of trolley service and nine new trolley stations from downtown to University City. Construction on the extension, including the bridge, began in 2016 and is scheduled to be fully completed in 2021.